Hypertension (High Blood Pressure) | Infonet Biovision Home. Hypertension is the result of persistent high arterial blood pressure which may cause damage to the vessels and arteries of the heart, brain, kidneys and eyes. The entire circulatory system is affected since it becomes increasingly more difficult for the blood to travel from the heart to the major organs. Multiple blood pressure readings are taken to establish an average and analyzed by a physician to determine hypertension. 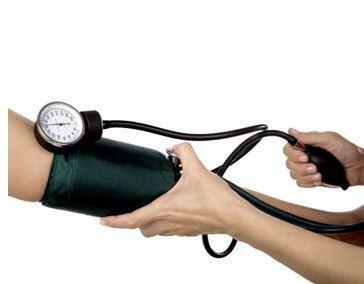 Blood pressure is a measure of pressure of blood against the walls of the arteries. It is dependent upon the action of the heart, the elasticity of the artery walls and the volume and thickness of the blood. The blood pressure readings are a ratio of the maximum or systolic pressure (as the heart pushes the blood out to the body) written over the diastolic pressure (as the heart begins to fill with blood) The 1st Number: Systolic pressure is the pressure generated when the heart contracts. The 2nd Number: Diastolic pressure is the blood pressure when the heart is relaxed. It is this pressure within the blood vessels which your doctor measures when he takes your blood pressure with an instrument called a sphygmomanometer (blood pressure machine). And what he is doing is checking to see that your pressure is within the normal range. To take your blood pressure the doctor winds a cuff around the upper arm just above the elbow so that the pressure in the main artery is registered on the instrument's calibrated dial. When the cuff is inflated your arm may tingle as the blood flow is cut off. The doctor listens to the artery at the elbow and as the cuff is let down slowly he notes the times when the blood flow begins again (you feel this as a pulsating sensation) and then when the noise disappears (you don't feel this). He may do this on more than one occasion and change you from the lying position to the sitting or standing position. Based on two readings taken 5 minutes apart with a confirmation reading in the contralateral arm. These are general guidelines for controlling hypertension. Hypertension cannot be cured, but it can be controlled through lifestyle changes and prescription medication. While medications to treat hypertension are available, research has shown that modest lifestyle and dietary changes can help treat and often delay or prevent high blood pressure. People trying to control hypertension often are advised to decrease sodium, increase potassium, watch their calories, and maintain a reasonable weight. For sodium-sensitive people, reducing sodium is a prudent approach to reducing the risk of hypertension. The recommendation for daily sodium intake is 1,500 to 2,300 mg a day. The amount of potassium in the diet is also important. Potassium works with sodium to regulate the body's water balance. Research has shown that the more potassium and less sodium a person has in his/her diet, the greater the likelihood that the person will maintain normal blood pressure. However, the evidence does not suggest that people with high blood pressure should take potassium supplements. Instead, potassium rich foods should be eaten every day. A newer area of interest is the relationship between calcium and high blood pressure. People with a low calcium intake seem to be at increased risk for hypertension. Everyone should meet the Dietary Reference Intake (DRI) for calcium every day. For adults, this is 1,000 mg per day. For adults over 50, 1,200 mg is recommended. Maintaining a reasonable weight is important to minimize the risk of several major diseases, including hypertension. For people who are overweight, even a small weight loss can dramatically reduce or even prevent high blood pressure. Learn to read labels to identify differences between brands of food. Be a wise shopper. Untreated hypertension causes damage to the blood vessels over time. This can lead to other health complications such as strokes, kidney failure, impaired vision, heart attack, and heart failure. A landmark study called DASH (Dietary Approaches to Stop Hypertension) looked at the effects of an overall eating plan in adults with normal to high blood pressure. Researchers found that in just eight weeks, people following the DASH diet saw their blood pressure decrease. A subsequent study called DASH 2 looked at the effect of following the DASH diet and restricting salt intake to 1500 mg per day. Under the DASH 2 diet, people with Stage 1 hypertension had their blood pressure decrease as much or more than any anti-hypertensive medication had been able to lower it. The DASH diet is an overall eating plan that focuses on what people should eat, rather than what not to eat. Rich in fruits, vegetables, complex carbohydrates and low-fat dairy products, the DASH diet is lower in fat, saturated fat, cholesterol, and sodium, and higher in potassium, magnesium, and calcium. The high levels of potassium, magnesium, and calcium in the DASH diet are thought to be at least partially responsible for its results. Table 3 below outlines the DASH eating plan. A Clinical Trial of the Effects of Dietary Patterns on Blood Pressure. New England Journal of Medicine.(1997). 336:1117-1124. J. Anderson, Colorado State University Extension food and nutrition specialist and professor; L. Young, M.S., former graduate student; and E. Long, graduate student, food science and human nutrition. 11/98. Revised 8/08. A. Ndong, Understanding hypertension (2010).